Authors: Drs. Jodi Korich, Joseph Wakshlag, Kenneth Simpson, Dwight Bowman, and Susan Wade. 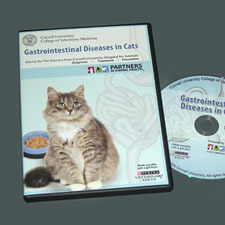 This comprehensive video series developed by veterinary specialists at Cornell University Hospital for Animals explores the topic of gastrointestinal diseases in cats. Featured topics include general information on vomiting and diarrhea, how to decide if your cat needs to be seen by your veterinarian, how to prepare your cat's GI history for a veterinary appointment, and what to expect during a GI work-up. This resource also includes helpful information on a variety of common GI problems in cats including food allergies, dietary intolerance, gastrointestinal parasites, inflammatory bowel disease, antibiotic-induced diarrhea, and diarrhea associated with diet changes. Each disease topic provides information on symptoms, how the condition is diagnosed, and treatment options, including the benefits of gastrointestinal diets and probiotic and prebiotic supplements to help manage GI disorders. ©2009 We recommend consulting with your veterinarian who is the best source regarding animal health issues in general, information about your specific situation, and possible new developments since the copyright of this material.